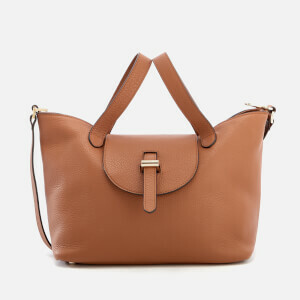 Women's medium tote bag from meli melo with a soft Italian leather construction. Showcasing a front flap with pull through fastening, the 'Thela' houses a spacious interior with a convenient zipped pocket. 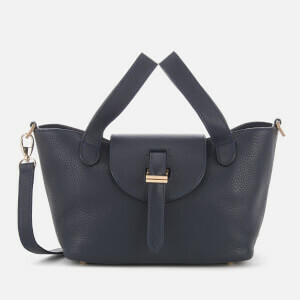 Featuring an optional shoulder strap and unique inverted top handles, the bag offers five carrying options for versatile wear. 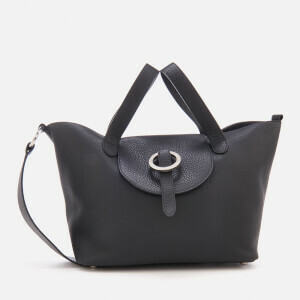 Complete with a tonal pouch that can be detached to form a clutch. Durable gold-toned feet to the base for protection.